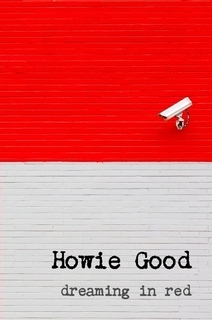 BOLD MONKEY: New Release: Howie Good Dreaming in Red. Right Hand Pointing. Lulu. 2011 (68 pages). New Release: Howie Good Dreaming in Red. Right Hand Pointing. Lulu. 2011 (68 pages). This is Howie Good’s fourth full-length collection of poetry and consists of fifty-two characteristically short experimental poems in which he adopts a variety of non-traditional forms, including- prose poetry, free verse, found poetry, collage and non-rhyming couplets. The language is simple but has a cut-up feel about it which can alienate occasional readers of poetry. There is no doubting that Good is an accomplished and adventurous poet and that much of our marvel of his poetry derives from our emotional reaction to what is difficult to rationalize in his work. As reader you must first navigate through his jig-saw, sometimes obscure experiments in language before you are offered a glimpse of what he is attempting to achieve. If you are patient and take your time with Good's work perhaps all will not be revealed- but he will open up new spaces in your head which may help shake you free from your set ways of reading and interpreting poetry. 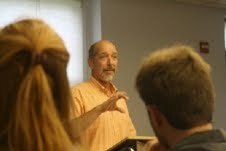 INTERVIEW WITH HOWIE GOOD 22 NOVEMBER 2011. Brief bio: Howie Good, a journalism professor at SUNY New Paltz, is the author of the full-length poetry collections Lovesick (Press Americana, 2009), Heart With a Dirty Windshield (BeWrite Books, 2010), Everything Reminds Me of Me (Desperanto, 2011), and Dreaming in Red (Right Hand Pointing, 2011), as well as numerous print and digital poetry chapbooks, including most recently Love in a Time of Paranoia from Diamond Point Press. BOLD MONKEY Q1: The imagery in Dreaming in Red is bleak and has an underlying sinister, apocalyptic tone. You make references to Nazis, terrorists, barbed wire fences, soldiers, beheadings, injustice, weeping, suffering- you explore in this book the metaphoric hell on earth. What is your overarching concept for the book and what are you attempting to express about humanity and our times? My poetry is sometimes referred to as surrealistic. I don’t necessarily agree with that characterization. It’s reality, not my poetry, that’s surreal. I’m just trying to convey some small but defining aspect of our time and place as I find it – cruel, hyper-violent, and bleak. In a paradox typical of art, the stranger or more unrealistic one of my poems seems, the closer it may approach what’s really going on in the world. Q2: There are numerous references to dreams and to the color red in your collection. Can you clarify some of the intended meanings/ associations you wish your reader to draw from your title and central motif Dreaming in Red? Readers should draw whatever conclusions they want from the references and images in the book. The poet’s task, as I understand it, is to write poetry, not to explain it once it’s written. The poem itself is all the explanation there is to offer. Q3: Many poems in the collection appear to be cut & paste in either free verse or prose poem form. You commented in your Fogged Clarity interview (linked below) that you like to ‘keep the reader off-balance.’ Can you elaborate in detail on your fascination with the cut & paste style? When a word or phrase or sentence strikes me while I’m reading or even during conversation, I write it down in my notebook. There they join material that’s more self-generated. All of it becomes the mud and straw for the bricks I use to build poems. Sometimes I’ll write a piece that’s kin to a found poem. In the book, SOMEONE WAS ALWAYS DYING SOMEWHERE and OVER YOUR CITIES GRASS WILL GROW are examples. They’re sort of verbal collages created from phrases I clipped from news sources and novels and arranged in what I hope is a provocative way. If you accept the premise that life in the twenty-first century is increasingly fragmented and discontinuous, then this may be the ideal form of writing to accommodate and capture the texture of modern experience. Q4: Since 2004 you have published at least four full-length collections of poetry as well as 31 print and digital poetry chapbooks. You also work as a journalism professor. I understand you write between 9 to 12 most mornings- but how do find the time and why the obsession with writing poetry at this stage of your life? I take seriously Flaubert’s admonition to writers: Be bourgeois in your habits, and revolutionary in your work. This is the antithesis of the stereotype of the poet as a wild man leading an irregular Bohemian existence punctuated by drunken binges, drug abuse, and sexual abandon. As attractive or exciting as that kind of life may seem, it’s not exactly conducive to sustained creativity. Flaubert recommended saving the wildness for your work, and not your living arrangements. Essentially, I practice the values of the old Protestant work ethic – industry, sobriety, and discipline – to get my writing done. Q5: Your poems are characteristically short and use simple, clear language. Considering your prolific output do you usually do much editing and re-writing of your work? I edit and rewrite extensively. I’ll even go back and revise published poems if something about them –an image, a word choice – bothers me in retrospect. It’s extremely rare that I “knock out” a poem. Most of the time I don’t know what a poem is trying to say or do until it’s gone through numerous rewrites. For me, writing a poem isn’t like taking down dictation. It’s more like digging for gold in hard ground with broken fingernails. Q6: You read extensively to aid your choice of subject matter. Can you outline some of your readings which contributed to the development of Dreaming in Red? I do read a lot, and not just poetry. I particularly find biographies of visual artists useful. It’s not so much content or subject matter I draw from them, but titles and what might be called “prompts” – phrases and ideas I can push off from. I feel a fellowship to visual artists. Maybe it’s because the creative process for poets is closer to that of painters than it is to that of novelists or essayists. When I read about a painter like Joan Mitchell agonizing for hours over one brush stroke, I recognize my own experience wrestling with words. Q7: A good sampling of your writing touches on the political but never explicitly. You characteristically present your views in a series of puzzles and language exercises. To what extent is this an accurate assessment of your work? Quite accurate if “political” is defined broadly, as the struggle to find a way to live together with the greatest amount of freedom and joy and the least amount of suffering and injustice. But I don’t often consciously write poems of political protest. Rather, given the times, any poem that questions the status quo is ipso facto political. Q8: On a lighter note, what is your advice to young promising poets just starting out? Organize your life around your writing, and not your writing around your life. And don’t be discouraged by rejection. Samuel Beckett’s first novel was rejected by 42 publishers; he eventually won the Nobel Prize for Literature. Thanks Howie and all the best with the book. All proceeds from its sale are for a great cause. All proceeds from the sale of this book benefit the Crisis Center www.crisiscenterbham.com .The Crisis Center is a non-profit agency in Birmingham, Alabama offering suicide prevention, services to victims of sexual assault, day treatment for the indigent mentally ill, and other services.